calibrel on sisseehitatud e-raamatute muutja, mida saab kasutada EPUB- ja AZW3 (Kindle) formaadis raamatute redigeerimiseks. Redaktor näitab sulle raamatufailides kasutatavaid HTML- ja CSS-faile koos reaalajas eelvaatega, mis uueneb muudatusi tehes. See sisaldab ka mitmeid automatiseerimise tööriistu levinumate puhastamise ja parandamistööde teostamiseks. Sa saad seda redaktorit kasutada, paremklõpsates calibres mis tahes raamatul ja valides Muuda raamatut. Videojuhend calibre raamatute muutja kohta on saadaval siin. When you first open a book with the Edit book tool, you will be presented with a list of files on the left. These are the individual HTML files, stylesheets, images, etc. that make up the content of the book. Simply double click on a file to start editing it. Note that if you want to do anything more sophisticated than making a few small tweaks, you will need to know HTML Tutorial and CSS Tutorial. As you make changes to the HTML or CSS in the editor, the changes will be previewed, live, in the preview panel to the right. When you are happy with how the changes you have made look, click the Save button or use File → Save to save your changes into the e-book. That is the basic work flow for editing books – Open a file, make changes, preview and save. The rest of this manual will discuss the various tools and features present to allow you to perform specific tasks efficiently. You can perform many actions on individual files, by right clicking them. You can rename an individual file by right clicking it and selecting Rename. Renaming a file automatically updates all links and references to it throughout the book. So all you have to do is provide the new name, calibre will take care of the rest. To merge multiple files together, select them by holding the Ctrl key and clicking on them (make sure you only select files of one type, either all HTML files or all CSS files and so on). Then right click and select merge. That’s all, calibre will merge the files, automatically taking care of migrating all links and references to the merged files. Note that merging files can sometimes cause text styling to change, since the individual files could have used different stylesheets. You can re-arrange the order in which text (HTML) files are opened when reading the book by simply dragging and dropping them in the Files browser. For the technically inclined, this is called re-ordering the book spine. Note that you have to drop the items between other items, not on top of them, this can be a little fiddly until you get used to it. In addition, EPUB files has the concept of a titlepage. A title page is a HTML file that acts as the title page/cover for the book. You can mark an HTML file as the titlepage when editing EPUBs by right-clicking. Be careful that the file you mark contains only the cover information. If it contains other content, such as the first chapter, then that content will be lost if the user ever converts the EPUB file in calibre to another format. This is because when converting, calibre assumes that the marked title page contains only the cover and no other content. You can delete files by either right clicking on them or by selecting them and pressing the Delete key. Deleting a file removes all references to the file from the OPF file, saving you that chore. However, references in other places are not removed, you can use the Check Book tool to easily find and remove/replace them. You can export a file from inside the book to somewhere else on your computer. This is useful if you want to work on the file in isolation, with specialised tools. To do this, simply right click on the file and choose Export. Once you are done working on the exported file, you can re-import it into the book, by right clicking on the file again and choosing Replace with file… which will allow you to replace the file in the book with the previously exported file. You can also import multiple files into the book at once using File->Import files into book. You can easily replace existing files in the book, by right clicking on the file and choosing replace. This will automatically update all links and references, in case the replacement file has a different name than the file being replaced. Edit book has a very powerful search and replace interface that allows you to search and replace text in the current file, across all files and even in a marked region of the current file. You can search using a normal search or using regular expressions. To learn how to use regular expressions for advanced searching, see Kogu teave calibres regulaaravaldiste kasutamise kohta. Start the search and replace via the Search → Find/replace menu entry (you must be editing an HTML or CSS file). Type the text you want to find into the Find box and its replacement into the Replace box. You can the click the appropriate buttons to Find the next match, replace the current match and replace all matches. Using the drop downs at the bottom of the box, you can have the search operate over the current file, all text files, all style files or all files. You can also choose the search mode to be a normal (string) search or a regular expression search. You can count all the matches for a search expression via Search → Count all. The count will run over whatever files/regions you have selected in the dropdown box. You can also go to a specific line in the currently open editor via Search → Go to line. Remember, to harness the full power of search and replace, you will need to use regular expressions. See Kogu teave calibres regulaaravaldiste kasutamise kohta. Function mode allows you to write arbitrarily powerful Python functions that are run on every Find/replace. You can do pretty much any text manipulation you like in function mode. For more information, see Function mode for Search & replace in the Editor. There is also a dedicated tool for searching for text, ignoring any HTML tags in between. For example, if the book has the HTML Empahisis on a <i>word</i>. you can search for on a word and it will be found even though there is an <i> tag in the middle. Use this tool via the Search → Search ignoring HTML markup menu item. Edit book has various tools to help with common tasks. These are accessed via the Tools menu. 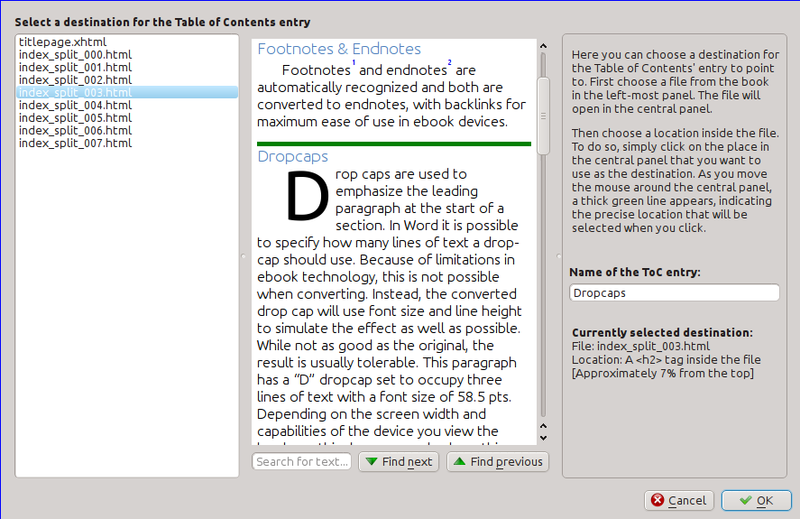 There is a dedicated tool to ease editing of the Table of Contents. Launch it with Tools → Table of Contents → Edit Table of Contents. The Edit Table of Contents tool shows you the current Table of Contents (if any) on the left. Simply double click on any entry to change its text. You can also re-arrange entries by drag and drop or by using the buttons to the right. 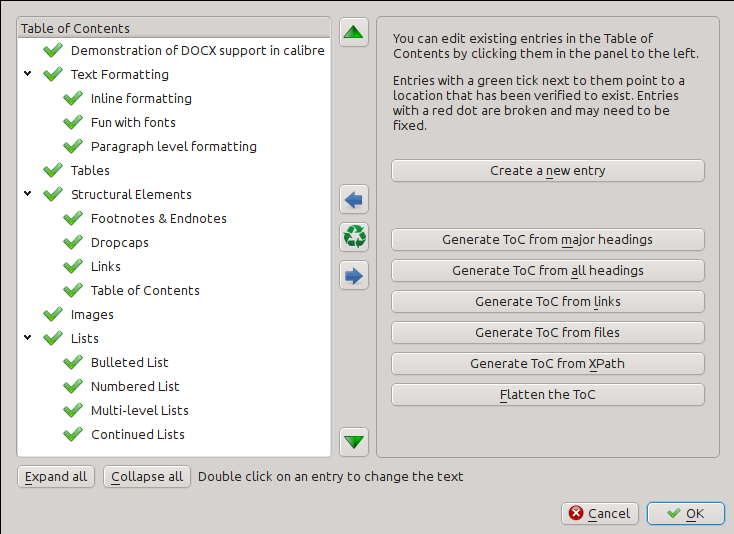 For books that do not have a pre-existing Table of Contents, the tool gives you various options to auto-generate a Table of Contents from the text. You can generate from the headings in the document, from links, from individual files and so on. You can edit individual entries by clicking on them and then clicking the Change the location this entry points to button. This will open up a mini-preview of the book, simply move the mouse cursor over the book view panel, and click where you want the entry to point to. A thick green line will show you the location. Click OK once you are happy with the location. The Check Book tool searches your book for problems that could prevent it working as intended on actual reader devices. Activate it via Tools → Check Book. Malformed or unknown CSS styles. Any CSS that is not valid or that has properties not defined in the CSS 2.1 standard (plus a few from CSS 3) are reported. CSS is checked in all stylesheets, inline style attributes and <style> tags in HTML files. Broken links. Links that point to files inside the book that are missing are reported. Various compatibility checks for known problems that can cause the book to malfunction on reader devices. This tool is used to auto-format all HTML and CSS files so that they „look pretty“. The code is auto-indented so that it lines up nicely, blank lines are inserted where appropriate and so on. Note that beautifying also auto-fixes broken HTML/CSS. Therefore, if you don’t want any auto-fixing to be performed, first use the Check Book tool to correct all problems and only then run beautify. Accessed via Tools → Beautify all files. Seda tööriista saab kasutada raamatu siseosade uuendamiseks, kui võimalik. Näiteks uuendab see EPUB 2 raamatud EPUB 3-ks. Sellele tööriistale pääseb ligi menüüs Uuenda raamatu sisemust. Checkpoints are a way to mark the current state of the book as „special“. You can then go on to do whatever changes you want to the book and if you don’t like the results, return to the checkpointed state. Checkpoints are automatically created every time you run any of the automated tools described in the previous section. You can see a list of available checkpoints via View → Checkpoints. You can compare the current state of the book to a specified checkpoint using the E-raamatute võrdlemine tool – by selecting the checkpoint of interest and clicking the Compare button. The Revert to button restores the book to the selected checkpoint, undoing all changes since that checkpoint was created. Reaalajas CSS-i paneeli saad lubada menüüs Vaade → Reaalajas CSS. On veel mõned tööriistad, mis võivad raamatu muutmisel kasulikud olla. You can run a spelling checker via Tools → Check spelling. 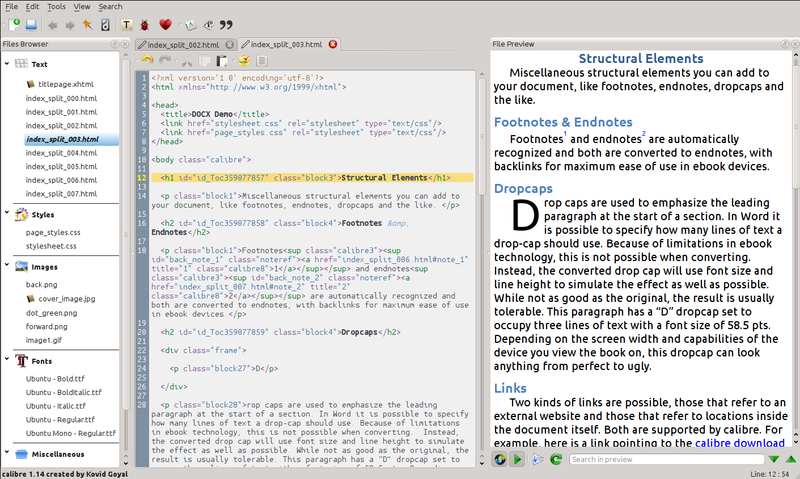 The calibre HTML editor is very powerful. It has many features that make editing of HTML (and CSS) easier. Spelling errors in the text inside HTML tags and attributes such as title are highlighted. 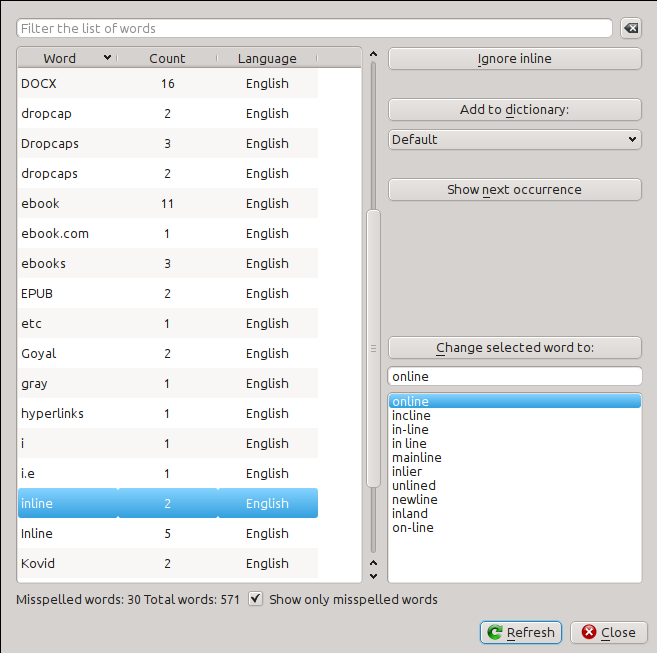 The spell checking is language aware, based on the value of the lang attribute of the current tag and the overall book language. Special characters that can be hard to distinguish such as non-breaking spaces, different types of hyphens, etc. 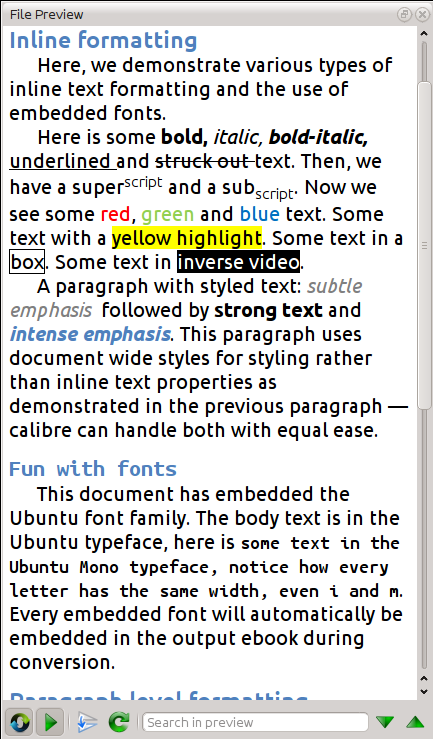 are highlighted. You can right click on an HTML tag name or a CSS property name to get help for that tag or property. You can also hold down the Ctrl key and click on any filename inside a link tag to open that file in the editor automatically. When editing an e-book, one of the most tedious tasks is creating links to other files inside the book, or to CSS stylesheets, or images. You have to figure out the correct filename and relative path to the file. The editor has auto-complete to make that easier. 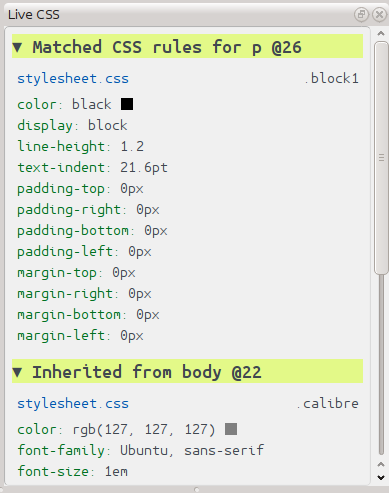 The calibre editor supports snippets. A snippet is a piece of text that is either re-used often or contains a lot of redundant text. The editor allows you to insert a snippet with only a few key strokes. The snippets are very powerful, with many features, such as placeholders you can jump between, automatic mirroring of repeated text and so on. For more information, see Katked.